You don't have to be a biophile to realise that having plants in your home can be a real breath of fresh air. Yes, having the right furnishings, hardware and broad design aesthetic is crucial to the overall harmony of your domestic interiors. But in so many ways, the beauty of our internal spaces comes down to the little things: the flourishes, the unique additions. Natural plant life can be a great way to enhance your home's aesthetic mix. But as well as being a visual bonus, it can also be a very healthy addition, for a lot of different reasons. 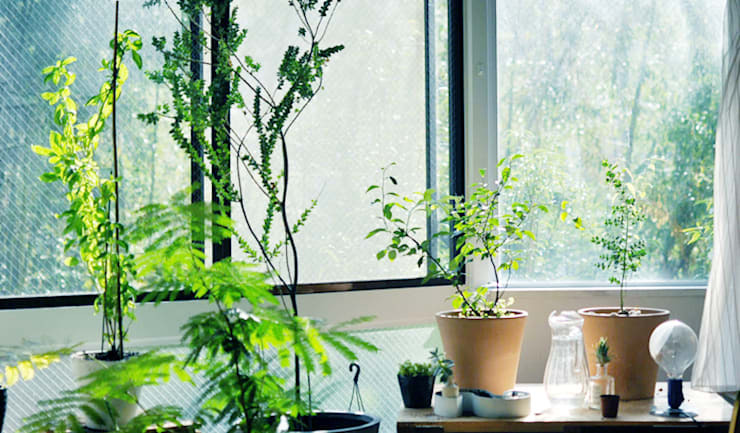 So many of us have become quite disconnected from the natural environment, and plants in the home help us to feel reconnected, a crucial thing in today's age of fast-paced, big city living. But on a more practical and physiological level, houseplants also help to distribute oxygen through the home, helping to nullify chemicals and vapours that exist through paints, varnishes, furniture and even some air fresheners. That's all well and good, of course, but where to start? Unless you're a budding greenthumb, it might be a difficult task to know how to bring in the right mix of plants that will work the best in your home interior. Today on homify, we're coming to the rescue with a look at a few timely tips on how to introduce the best selection of greenery in and around your home. Read on, get inspired, make your home more breathable and reconnect with the natural world. Selecting plants: which varieties are the best? So, we've established the benefits of having plant life in your home, and how they can really bring your home to life—but which ones to pick? There are so many species and varieties out there that we're very much spoiled for choice. Ultimately, it's always a good idea to pick ones that are easy to care for, that way, you won't have to worry too much about their upkeep: just a basic water every couple of days, depending on the species. Anything too fragile, such as orchids and maidenhead ferns, might become a chore to look after. Resilient species are always a good option. As far as health benefits are concerned, some species really work wonders at detoxifying the air in your home. English Ivy, Bamboo and Peace Lilies are a few excellent examples, bringing an abundance of natural oxygen into the home, and working particularly well against toxins such as formaldehyde. These species are generally rather versatile too, and can be grown in planters, hanging baskets and pot plants for the floor. Ultimately, there are a lot of choices when it comes to bringing in plant life to your domestic setting. If you're having trouble making up your mind, why not chat to a professional for a little extra help and guidance? Plants work well in almost every setting in and around the home, but as a general rule, it's always a good idea to introduce new varieties in a minimal fashion, without going too overboard to begin with. A single pot, or perhaps a matching couple, can work just as well, if not more effectively, than a whole interior jungle (though that could look pretty fantastic in the right setting too). Ultimately, if you're just beginning to introduce plant life into your home, go slow and add piece by piece as needed. The 'less is more' motto really functions in this context. 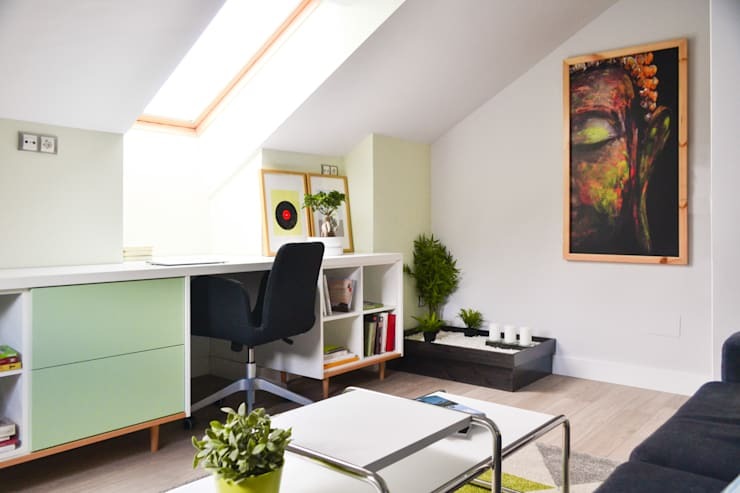 Here, for example, in this cosy attic study space, we have a great room, set up with ample natural light to enhance productivity and calm. But it's the thoughtful, uncluttered addition of two plants—one larger feature in the corner, and a single table top option in the foreground—that really enhanced the space, offering it an extra dose of breathability and natural verve. Not necessarily taken by lush green and colourful plant varieties? Does your home demand something a little different? There's always something to suit the needs of any home, and here we have the perfect alternative. Introducing the common household cactus: not only great to look at (and iconically prickly) but a plant with so many benefits attached. The first one is, of course, that they're ideal for the beginner; cactus plants are used to difficult growing conditions and a lack of care and attention. Despite all this, they thrive. It means that you can have a fine, veritable selection of beautiful cacti in your home, with very little effort on your part: just a little sunshine, some good soil and a little water here and there. In this great example, we see a home space thriving with plant life. But amidst the creepers and generic pot plants, the one that really punctuates the scene is the chunky, full and rounded cactus in the centre: a unique feature in any home. If ease of use and minimal care is your priority, look no further than the tough, resilient and ever reliant cactus. A lot of the time, one of the main decisions we'll need to make about how to introduce plant life into our homes will comes down to placement and style. Should I choose hangers? Pot plants? Or perhaps a little topiary? Though choosing the right species variety is the number one priority, the display and placement runs a close second. Ultimately, the choice is yours; each space in the home will respond well to different types of plant placements. 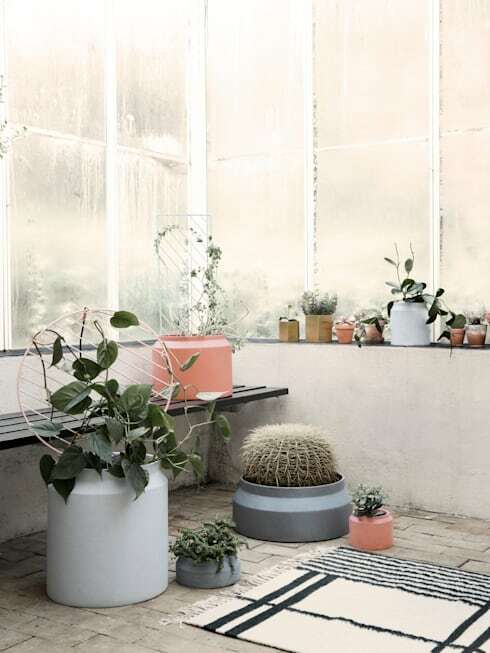 But for a basic, resilient option with a lot of versatility, you can't go past the humble potted plant: mobile, flexible, elegant and neat. They come in a range of different materials: clay was once the interior go-to, but in recent years has been superseded higher-grade, more resilient plastic alternatives (keep in mind, even plastic can crack and break in cold weather). As well, ensure your pots have sufficient holes for water drainage, otherwise root rot can become a problem, compromising the health of your plants. You'll also want to consider the size of your pots: here, we see a delightful small to medium sized pot working wonders in a light-filled interior space. Gauge the aesthetic needs of your space, and work your way out from there. Pot plants can work in single form, but can also work wonderfully as part of a team. If one pot just won't be enough for your interior space, consider getting crafty and creating your own unique configurations. 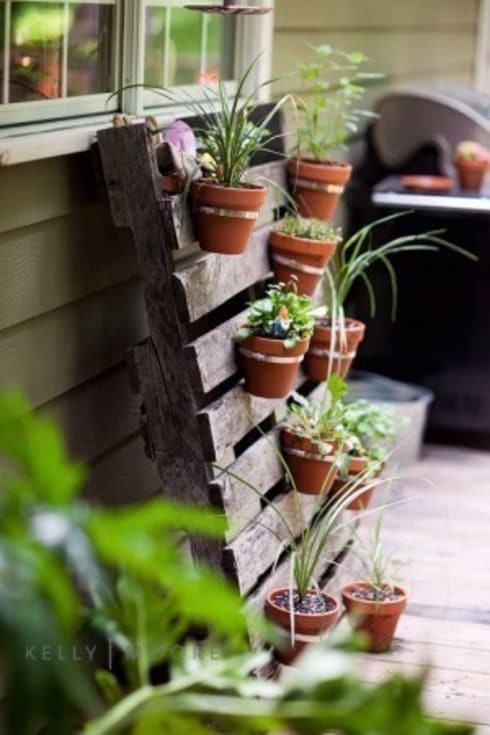 Here in this example, we see a fabulously DIY plant project at play: a repurposed, up-styled wooden pallet, relishing in a fresh role as the hanger to a family of cute, tiny pot plants. But wait—we're not talking about any old plants here: we're talking about herbs. Adding herbs in and around the home is a great idea: something that looks amazing, but also offers a range fabulous kitchen staples for adding the right spice to your delicious home cooked meals. As lush and verdant and easy on the eye green plants can be, they aren't the be all and end all. So too, the minimalist approach to adding plants to the home is more a guiding principle for the beginner, a loose rule designed to be broken. If green plants aren't your thing, and you're searching for something a little more vivacious (not to mention abundant), by all means go all out and install something truly fabulous and larger than life. 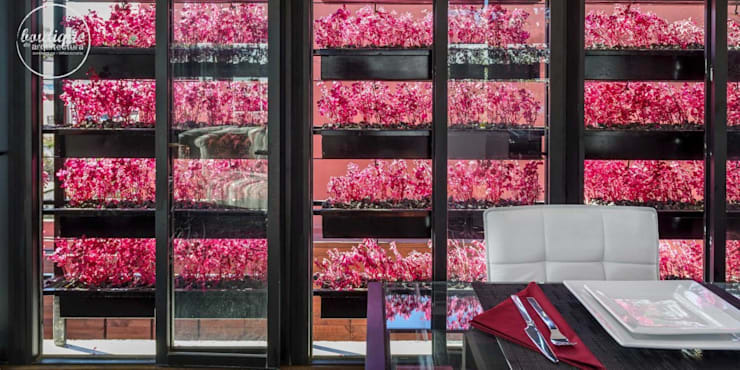 Here, in this incredible flower house, we see a home that actually revolves around its plant life: four-tiered rungs of rich, pink flowers in feature rectangular pots right by the living space. Sometimes, more really is more. Whatever the case, be sure to embrace plant life as you see fit: experiment with different varieties and turn your home into something wonderfully thriving, healthy and effortlessly oxygenated. Did you like that Ideabook? 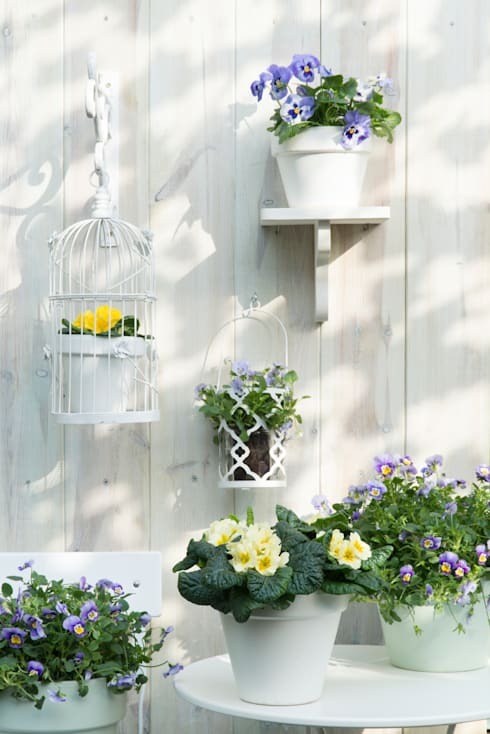 Why not keep the ideas flowing with a look at Inspired ideas for growing plants? Do you have any other handy greenery tips for our readers? We’d love to hear from you in the comments section below!